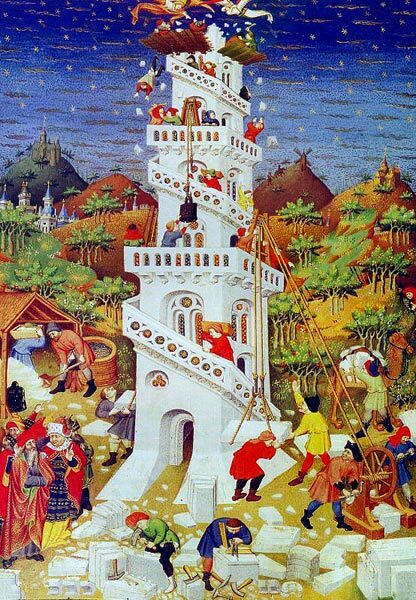 The Building of the Tower of Babel from the Bedford Hours (1414-23) vellum, Master of the Duke of Bedford workshop, British Library, London, UK/ copyright British Library Board/ All rights reserved/ Image courtesy of the Bridgeman Library and featured in My Dancing Day : Reflections of the Incarnation in Art and Music. As you gaze at this busy scene, think of all of your holiday preparations and resolved to slow down this year. Those were the words I used to start my journey into the heart of Christmas some 5 years ago. As I look back now, I can see that life has not gotten simpler but only more and more complicated as the years have passed. Everyday becomes an ever present battle in deciding where to cast my attention, who should get the first fruits and were can I juggle something so that I can be all things to all people. We are all being hard pressed from every side and many times we are forced to decide that those nearest and dearest to us must be pushed aside. Just this morning as I was jumping into the shower I had to stop and ask myself “Did you eat breakfast this morning?” I honestly couldn’t say…. Well needless to say that was a wake-up call. and I stopped, and suddenly realized the profound truth of this statement…and so while I haven’t perfected this by any means, I am pursuing things a little more calmly now. vs. 1.Since, then, you have been raised with Christ, set your hearts on things above, where Christ is seated at the right hand of God. vs 12. Therefore, as God’s chosen people, holy and dearly loved, clothe yourselves with compassion, kindness, humility, gentleness and patience. Dear Lord, as we travel through our busy week, help us to remember that you are in control of all things and that everything will work together for your glory. Teach us to slow down to stop and smell the roses so that we may lean into your loving arms and hear your voice. P.S. 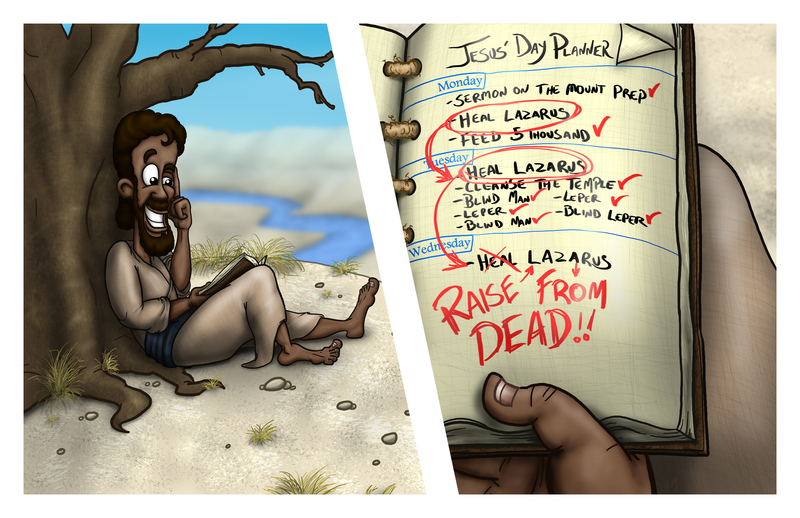 As I was meditating on the phrase “deadline” I asked my good friend Adam Nettesheim, (who I have made “Grand Knight’ of the order of God thru the Arts;) to create an image that would take a light hearted look at this idea in connection with Jesus raising Lazarus from the dead. I love his reflection of Jesus and his day planner as he struggles to meet everyone’s needs. 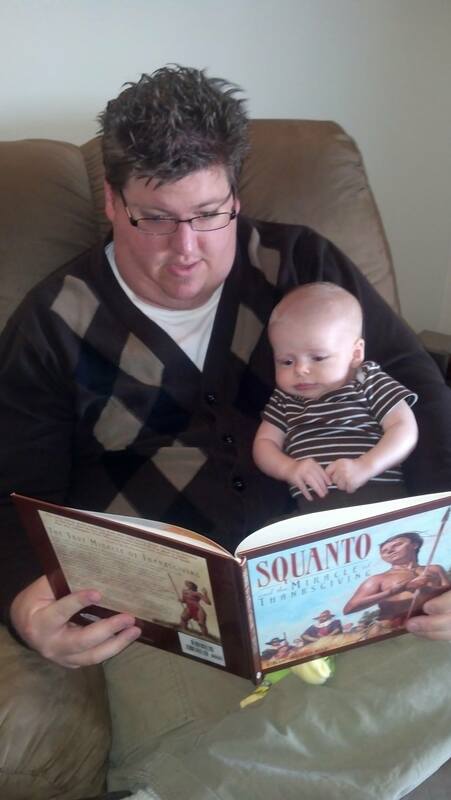 Take a moment to get to know my Christian brother Adam R. Nettesheim who was born and raised in Colorado and currently lives in the City of Loveland with his beautiful & talented wife Sarah and their bouncing baby boy Graycen. He has a Bachelor of Arts in Media Arts & Animation from the Art Institute of Colorado. I met this family while I was speaking at the Tulsa Workshop in March. We were, as you can imagine, very happy to find fellow artists in our faith community. He and his wife own N Brain Studio – a freelance media company which specializes in animation. Adam is also working on a project called “The Witness Cloud” which will be visual walkthrough of the Hebrews 11 “Hall of Faith”. One of your best blogs. I can really set my teeth into the concept of, “Stop and smell the roses”.